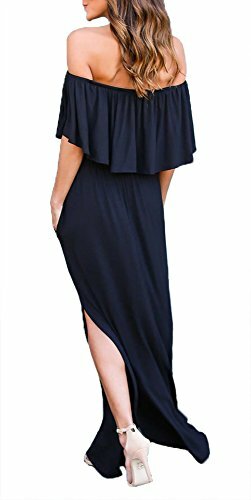 BUST: (S)33.07 inches (M)34.65 inches (L)36.22 inches (XL)37.80 inches Cotton+Spandex, Lightweight, Soft and stretchy. 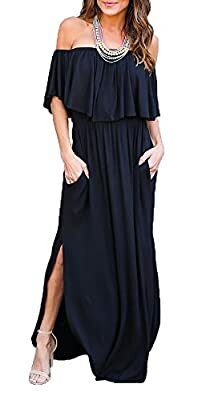 Features: off shoulder, short sleeve, ruffles, vintage, side split, loose fit, casual wear, long sundress, swing dress, side slit party maxi dress, long beach dress, high waist both sides split, tunic waist, strapless maxi long dress, Summer casual long shift dress. The design of off shoulder is not too tight or too loose. Side split design makes the dress spins beautifully. Look perfect with this maxi dress by pairing it with your favorite necklace and sandal. Four way style to wear, off the shoulder, with shoulder, one shoulder and tube style. It can be dressed up or down. The top portion of the dress can be changed to fit your personal style,fun yet elegant and sophisticated at the same time. 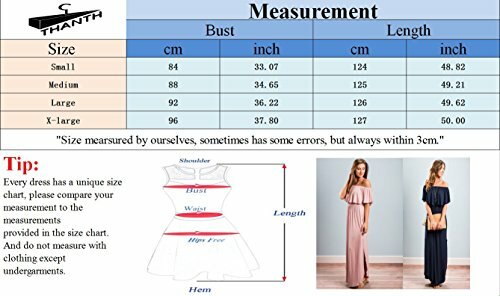 Summer Fashion Street wear Tee dress, Juniors Casual Dresses, Off shoulder maxi dress for teen girls, Loose both sides split will Keep you Comfortable All Day Long.